The admin has an ability to make any changes in the product details such as to update the price of the products, inventory of the products, the barcode of the products, or any other details. Go to the Newegg Marketplace Integration App. On the top navigation bar, click the Import/Export menu. In the Select Options list, select the required product status. Click to select the Save File option, and then click the OK button. The CSV file is exported and saved at the selected location of the local system. Make the required changes in the required fields and then save the CSV file. 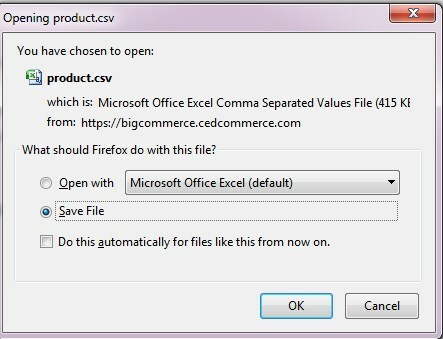 Click the Browse button and select the required CSV file. Click the Back button to go back to the Update Product Information page.